A version of this article was published in The Washington Jewish Week today 10/10/2013 with the Brussels Sprout Gratin with Potatoes and Spinach recipe from Katzen's 'The Heart of the Plate'. If you are a subscriber, or pick up a copy at newsstands in the DC metro area, find the article on page 30-31. You can also click the links above to access it. 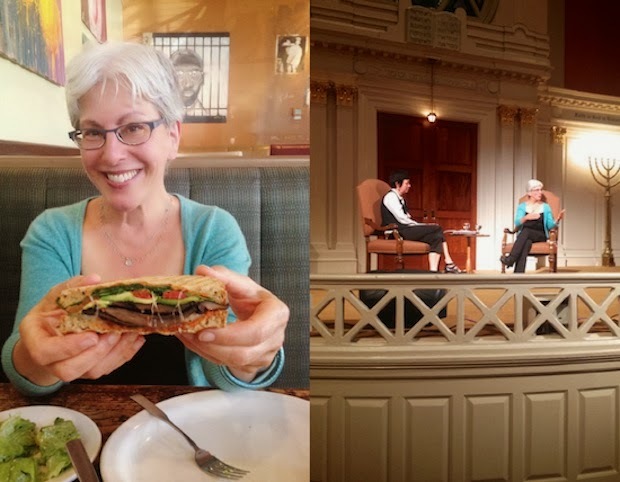 Traveling from her home in Northern California, Mollie Katzen (62) kicked off her 12th cookbook, 'The Heart of the Plate' (Houghton Mifflin Harcourt) whirlwind of a cookbook tour at Sixth and I Historic Synagogue in DC on Sept. 17th. The Heart of the Plate dropped the same day. Katzen, with over six million copies of her books in print, is best known for 'The Moosewood Cookbook' (1977) and with it introduced, some say single-handedly, America to vegetarian food. Katzen, modest, waives her hand at these claims. As a young woman in college, Mollie Katzen cooked vegetables when she left home because of her Orthodox upbringing. It was the simplest way to keep kosher. Later on at Moosewood in Ithaca, NY, a collective she and her brother helped found, cooking meat was just not in the cards. While vegetables shined at Moosewood's kitchen, cooking meat was not as successful. Recipes in 'The Moosewood Cookbook' had the kitchen sink approach. Throw in all the veggies in a casserole. Today, in 'The Heart of the Plate', Katzen shines the light on each vegetable individually. She draws out maximum flavor with quick and minimal preparation using various techniques and cooking methods. High heat and salting at the right moment just to name a couple. Katzen does so in 'The Heart of the Plate' with beautifully illustrated watercolors and vibrant photographs. Drawn and photographed by Katzen throughout this stunning volume. 'The Heart of the Plate' pays homage not only to Katzen's creativity with vegetable based food but also to her trained artistic background and poetic soul. Shining the light on the vegetables became a cinch with the wider availability of local fresh quality produce, access to farmers markets and availability of good olive oil. Olive oil takes center stage at 'The Heart of the Plate' and replaces the abundance of sour cream, butter and eggs Katzen used to dabble with in her earlier cookbooks. In the Moosewood days, good olive oil was virtually unavailable. The US was getting a 3rd and 4th olive oil press inferior quality imports, says Katzen. Fortunately, today extra virgin olive oil is available on the grocery shelves and is even produced in the US. Katzen, a 2007 James Beard Cookbook Hall of Fame inductee isn't a vegetarian. She will once in a long while have a non-vegetarian nibble. Katzen has a deep respect for personal dietary choices but does not wish to compartmentalize vegetarian cooking. She would like to shed the labels. She wishes us all, herbivores and omnivores alike, to celebrate vegetables and make them a larger part of our daily meals and holiday tables whether we are vegetarians or not. Katzen has evolved as a cook and a cookbook author with the availability of fresh produce and quality cooking ingredients, hence the title of the book 'The Heart of the Plate: Vegetarian Recipe for a New Generation.' For the evolved older generation and the new and upcoming younger generation of cooks. In response to a Sixth and I audience member's question 'which vegetable she loves the most?' Katzen said that she loves all vegetables but her recent infatuation is with anything avocados. The most underrated vegetable Katzen further adds is the celery root. Katzen was engaging with incredible food stories peppered with a great sense of humor. In retrospect, Katzen's response explained our order at my dinner with Katzen, just a couple of hours prior to Katzen's conversation with moderator Sally Swift, managing editor at The Splendid Table, and book signing at Sixth and I, that day. I arrived early at Busboys and Poets at 5th and K, just a couple of blocks walking distance from Sixth and I in DC. When I turned at a tap on my shoulder, I saw a petite glowing woman I recognized. Katzen and I warmly embraced and we talked about her kids, my boy and her extensive family in Israel as if we were long time friends. We were short on time but I wish I shared with Katzen how instrumental she was in my own metamorphosis in the kitchen. Minimally cooking vegetables without losing their nutrients by cooking them too long. The innovative way Katzen pairs ingredients pushing me to think outside the box. On my bookshelf arsenal I've got not only 'The Moosewood Cookbook' but also 'The Enchanted Broccoli Forest'. Katzen's Mediterranean Lentil Salad from her 'Still Life with Menu' cookbook is a staple in our house. When my son was younger, I bought 'Pretend Soup,' part of a cookbook trilogy Katzen wrote geared towards young kids. At Busboys and Poets we shared a salad and a panini. Katzen was cooing over the avocado panini with havarti, arugula, roasted red pepper and roasted portabella mushrooms on multi-grain bread. It came with a side of sweet potato fries. Both Katzen and I loved the sparingly dressed mango and avocado salad with jicama, radish and butter lettuce tossed with hemp vinaigrette. You would think the menu at Busboys and Poets was custom-written for the everything avocado and all vegetables queen, Katzen. Stay tuned for 'The Heart of the Plate' cookbook GIVEAWAY coming soon. 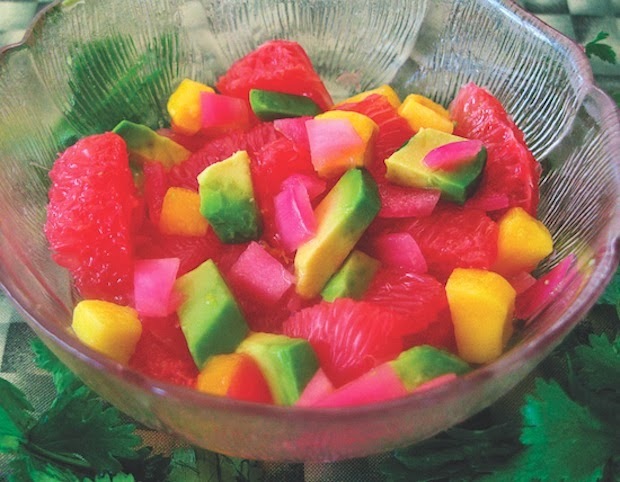 Bright green avocado visits the other side of the color wheel to join purply-red onion, pink grapefruit, and sunny mango in this sparkling collaboration. Wonderful on its own—and a great brunch appetizer served in little bowls—this also goes well with any savory dish, especially cornmeal-based items. Try to find a perfectly ripe avocado that is mostly firm but gives a little when you press it respectfully. You want one that is not too soft, so you can get clean little squares that stay distinct and won’t mush into sauce. To remove the grapefruit sections from their membranes, first peel the fruit completely with a serrated knife. Then hold it over a bowl, sawing in and out of the membranes with the same knife to release the sections. (Push aside any seeds as you go.) Squeeze in the juice from the membranes and discard them. (Keep a few damp towels handy.) This method also works for oranges. Without the avocado, this will keep for up to a week in a tightly covered container in the refrigerator. Once the avocado is in, serve the dish within an hour. 1. Put on a kettle of water to boil. Place the onion in a strainer over a bowl in the sink. Pour the boiling water over the onion and let it drain for at least 5 minutes. 2. Put the grapefruit in a medium bowl. If using fresh mango, cut the mango off its pit, peel it, and cut the flesh into small pieces. (If using frozen mango, cut the undefrosted larger cubes into small dice.) Add the mango to the grapefruit, scraping in as much of the messy, delicious mango pulp as you can retrieve from the cutting board. 3. Stir in the onion, along with the salt (if using) and sweetener. Cover and refrigerate until shortly before serving. 4. Just before serving, pit, peel, and dice the avocado and gently stir it into the mixture. Adjust the salt, if desired, add a little cayenne to taste, and garnish with a few cilantro leaves, if desired. Serve cold. Photo credits: Top collage: Head shot: Lisa Keating, Watecolor illustrations: Mollie Katzen. Middle photos: Shulie Madnick taken with an iPhone. Saladita: Mollie Katzen. 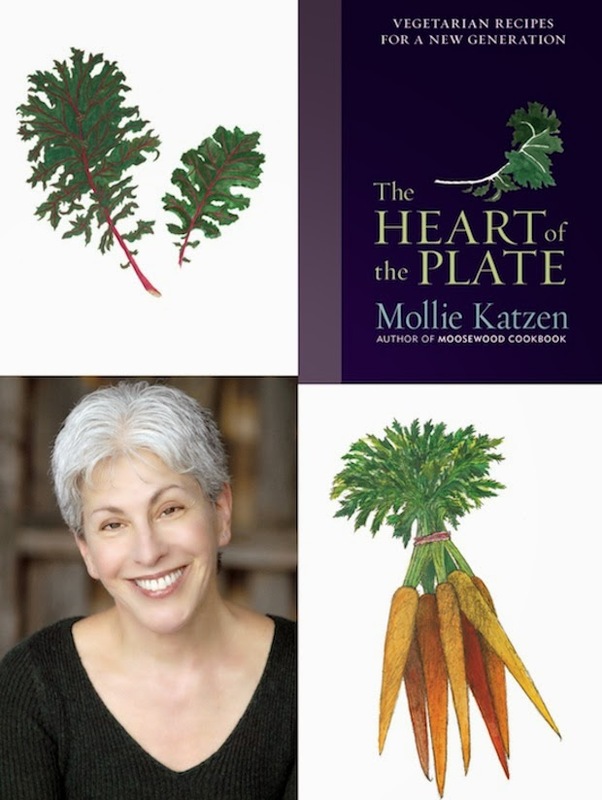 Excerpted from 'THE HEART OF THE PLATE', © 2013 by Mollie Katzen. Reproduced by permission of Houghton Mifflin Harcourt. All rights reserved. An interesting book and lovely salad! What a great story and review. I loved that book! What fun you must have had! A great commentary on a wonderful figure in food, Shulie. And the salad looks so fresh and colorful! She sounds like a great role model Shulie! The saladita looks so very inviting. Imagine one day I will be able to say that all the fruits for this dish were homegrown. An appealing post! I am poised to order this great new book by Mollie Katzen. Her cooking approach with vegetables is the inspiration we all need to move to a diet that is more plant centered. What an absolutely stunning looking salad! Thanks for sharing! What a fun day for you!!! I am now craving avocados...and wish I had that salad in my fridge. It is so vibrant and beautiful! What a beautiful person and a lovely role model. Seems like a great great day. Avocados I always have in hand, the whole combination is so inviting. Love the salad, it's especially beautiful in color. Even though it's Fall here, looking at that Salad puts me back in the summer mood, thanks for sharing!